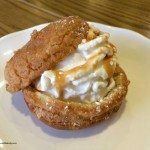 Right now, if you’re in the central Texas area, you might find an unusual treat on the menu: the Starbucks Cream Puff. 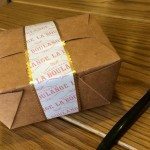 It’s a traditional sweet dough, made by La Boulange with whipped cream, and garnished with a caramel sauce or mocha sauce and powdered sugar. 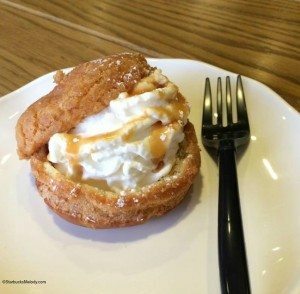 Each cream puff retails for $2.45 and has roughly 260 calories. The Starbucks Cream Puff is handcrafted – your barista will put it together for you. The cookie dough part of it is just slightly crunchy. My understanding is that you can ask to substitute in the new marshmallow whipped cream (as opposed to the traditional whipped cream made with vanilla), which was just introduced into the stores on April 28, 2015, for the new S’mores Frappuccino. The new Cream Puffs sound yummy! Let me know how you like it! Whenever I write about test items, I have to include the caveat that Starbucks tests more items than what makes it to a national launch. For example, coconut milk started out a small test in Portland, Oregon in 2014, and made it national launch in February 2015. In contrast, the Starbucks Pink Lime Frozt went through two rounds of major testing before it was given the axe by Starbucks. Feel free to browse the test products category. Who knows what we might see some day at Starbucks? Beef brisket anyone? Frappuccino Happy Hour: An Extra Hour of Happy - Lite and Yummy! Ok this one looks good but I can see problems with it if the partner has to put it together. Also, wonder how it can only be 260 calories? Melody, where in Texas? I would be happy to drive from Dallas and try it for you! As far as the brisket, I had it when they were testing it in Arizona and loved it. I hope that becomes a reality soon. @Michelle Nyhan – I’m still working on getting more specifics but so far all I know is that it’s numerous stores in Austin and San Antonio. Good question. I agree that it looks good but with every item like this that Starbucks brings out they just get further and further from their coffee roots. Partners will not have time to put these things together for everyone ordering them. They’ll have people complaining that there is not enough whipped cream or the wrong flavor, etc. I wouldn’t order one. I think something like a real cream puff should come directly from the bakery where it’s freshly made. Starbucks are clearly not following any health agenda at the moment. The current product launches are horrendously calorific. I agree that it takes the brand further away from coffee which is ultimately disappointing. @Chris – Americans aren’t following a healthy diet. It’s not a Starbucks thing. If we cared about a healthy diet, the candy aisles would shrink to nothing, Dairy Queen would go out of business, and Hershey’s Chocolates would need a new focus. If Americans ate healthily, McDonald’s, Pizza Hut, and more would go out of business. I’ve heard that Disney Parks did a big test of “Better for You” items and discovered that while people said that’s what they wanted, it’s not what sold. I can’t criticize Starbucks for delivering things that people really do want to consume – it’s good for business. I’m always dumbfounded at the constant conversations about diet. Yet when I look around me, I’m stunned at how badly most people eat. Most people have no qualms picking up a donut (deep fried grease, sugar and fat!!) and coffee at the office, yet out of the other side of their mouths will profess that Starbucks is not healthy. This is also the reason why I cringe when I see many partners get a look of disdain over very sugary drinks – I bet you dollars-to-donuts, 99% of baristas don’t eat healthy either. Pick your poison. And everything in moderation! i would use the new marshmallow whipped cream in there. Looks good. We have the BBQ beef brisket at my store. It’s not a huge seller and it’s WAY overpriced. $7.44 for a brisket sandwich that’s previously made and frozen. Honestly, for that money, our customers can go next door to Burger King and get a whole Meal. I’ll be shocked if that sandwich makes the cut. @AlissaH628 – Well, neither the Beef Brisket or any burger from Burger King is going to be good for you. I’d agree that the price tag sounds a little high. I’m a little surprised because it’s seemed to me (just anecdotally speaking) that test pricing is sometimes a little lower than the final price tag on an item. Well said Melody, most of what is sold outside is not good for you anyways. I think that every individual makes their choice of what they consume. It is not anybody’s job to criticize or put down others because they don’t meet their views. I follow a strictly healtht diet but that doesn’t mean I can’t binge every onece in a while. Besides, most of the Bistro Boxes, Salads, Yogurt and all that are pretty healthy options. 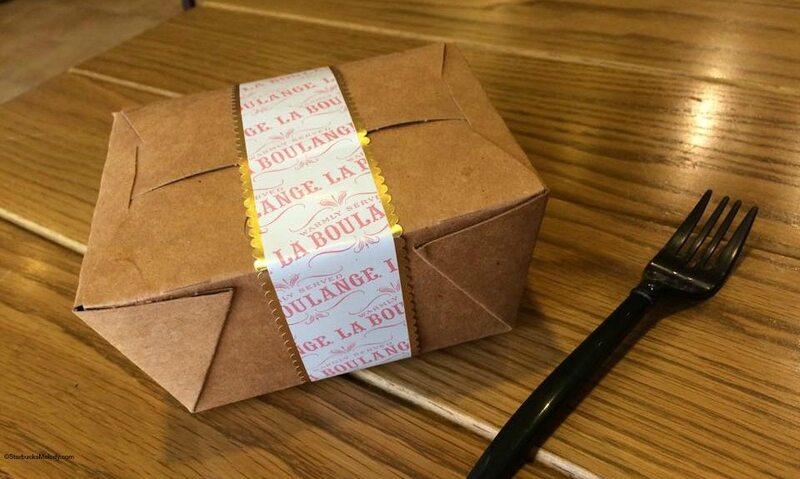 It’s really only 80% of the La Boulange items that are kind of high calorie. Maybe cut it in half and save the rest? Starbucks is very flexible to both health concious people and the S’mores Frappuccino in the Tall size with no whip, nonfat milk, and lessened pumps has about 200 cal. Not too bad? That’s just my two cents. Imho, that cream puff looks so delicious!! But, how is a barista going to prepare it with the health regulations? Maybe gloves? I’m in Akron, Ohio and I want a cream puff!! Think they might come this way Starbucks Melody? Don’t cream puffs typically have more of a custard cream filling? And I’m assuming these won’t be warmed to prevent the whipped cream from liquefying. The comments about labor are interesting. As Starbucks moves to more and more things they’re going to find themselves in a situation like McDonalds is currently in – too many items requiring different steps and training and supplies resulting in a degradation of the service experience. 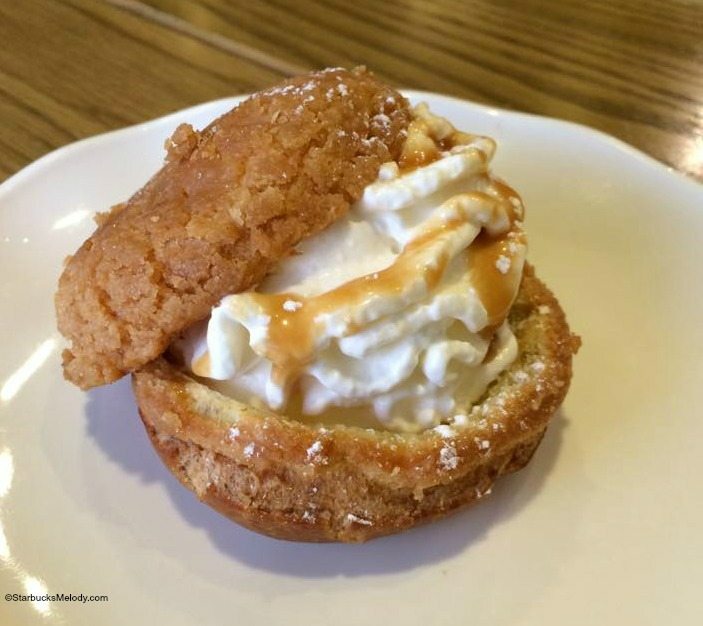 We’ve got the cream puff in Minneapolis. Had it with marshmallow whip and mocha drizzle. Was Delish! I had one with vanilla cream and caramel drizzle today in Austin. It was pretty tasty! I’m surprised this wasn’t tested in Wisconsin because of the association of cream puffs in the state.